The smell of a sun-tanned leather saddle, dry hay, horses feeding, and a big Texas sunrise sky at 4 am are pretty common senses for alum, Mitch Gassen (Class of 2011). Currently Mitch resides in Stephenville, TX, where he trains and breaks horses—a real cowboy, you could say, but there is a lot more responsibility and mental dedication to his ultimate future and career, which he is working for every day. For a year and a half, Mitch has been training quarter horses, gated horses, thoroughbreds, and more. An average day is 14-16 hours of work—the longest is 22, that he can remember. Oh, by the way, that is six to seven days a week! 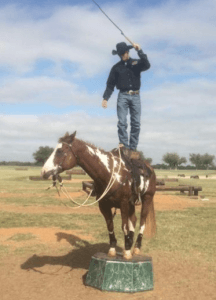 Down Under Horsemanship Academy in Texas has thousands of applicants yearly across the nation but only eight where chosen to “try out.” Throughout the process students can be sent home at any time if the instructor feels they aren’t what he is looking for. Currently, only two remain in the program, one of them being Mitch. When the academy starts, students partake in a ten day colt starting clinic. Once you are accepted, the next phase is a ten day fundamental clinic, after which you find out if you have formally been accepted into the program or not. Then there is a 14 week trial period where the students train two horses full time along with “grunt work” such as tending to the barns and horses, maintaining the tack equipment, etc. Students are put on payroll after surviving the first 14 weeks. Their duties are increased to training three horses, then moving on to four with experience, and duties shifting to full time training horses. Ultimately, the goal is to break the horses into being quiet, soft and respectful. Mitch is breaking client horses from across the entire country and travels with Clinton Anderson, the program instructor, on his tour stops where he teaches the public about his horsemanship methods. Once you complete the clinician academy program, people from around the world can hire you to instruct private lessons and clinics for their horses depending upon the level of certification you have received. Ultimately, Clinton Anderson has stamped Mitch with the rights to use his brand and methodology of training horses when he markets himself for clients. He is helping “extreme problem” horses to become docile respectful horses that clients can compete with, show, or just ride for leisure. Clients send their animals down to Texas to experience the Down Under Horsemanship program as a last-ditch effort to have a partnership with their animals. Mitch has found a way to work with his hands and God-given abilities doing amazing things in an unconventional way. He will be the first to tell you that even though he is working long hours each day, it doesn’t feel like work because he has so much passion for his trade. In a world of the here-and-now, technology, and rush hour, Mitch has found ambition in patience, hard work, and following the plan the Lord has laid out for him.